For Impact is a team of entrepreneurs. This mantra is so important to us, that we’ve also made it one of our 9 Guiding Principles. Think Big with your VISION. How are you changing the world or your world? Think Big with your ASKS. You can’t get $1M if you can’t communicate what you would do with $1M! Think at a higher level. Get up out of the weeds and see the problem, opportunity, team and solution at 30,000’! 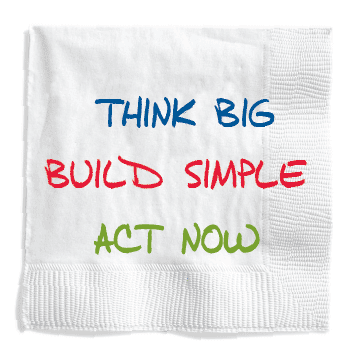 Get your MESSAGE on a napkin! Simplify what you do using the Rule of 3. Focus on 10 prospects who could TRANSFORM your funding … and TRANSFORM your organization. Stamp DRAFT on everything and go visit! Just Visit. Just ASK. Ten steps forward and two steps back is still eight steps forward. Tom brings a more powerful voice to the ENTREPRENEURIAL SPIRIT. Not only has he started the 19 companies, but he’s traveled the world visiting with and mentoring social entrepreneurs. Here is a one-pager on TB/BS/AN from Tom.